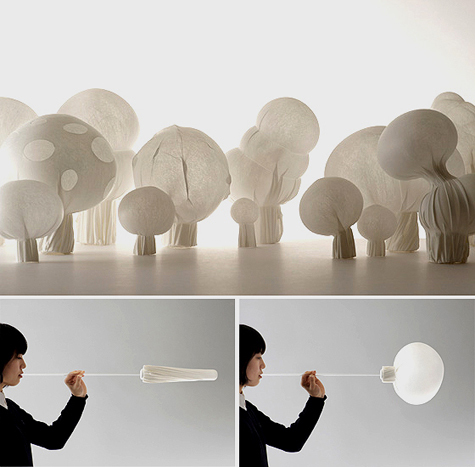 Blown-Fabric by Nendo was created for Tokyo Fiber ’09 Senseware, an exhibition intended to convey the possibilities of new materials developed with Japanese synthetic fibre technology. "Smash is a specialized long-fibre non-woven polyester that can be manipulated into different forms through hot press forming technology. Because it is thermoplastic, light and rip-proof, but glows beautifully when light passes through it, we wanted to create lighting fixtures in the style of vernacular Japanese chochin paper lanterns with it."